A book update, sort of, and a funny video just for the heck of it. Interesting post, Matt. 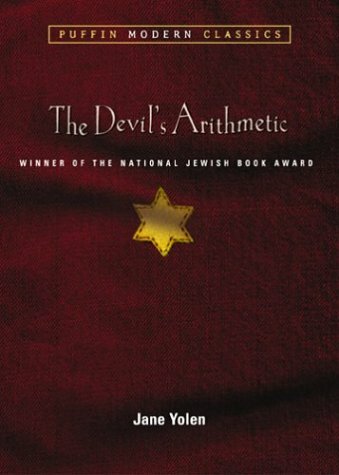 I’m sitting here stunned that a mother would take a book like Devil’s Arithmetic out of her child’s hands. Not ready? If she’s in her teens, how could she not be ready to enlarge her understanding and compassion by experiencing a mild version of the horrors that happened then? So many Holocaust books helped me learn to feel pain with another person, taught me to think carefully about all possible consequences of the way I behave and treat others: Anne Frank, the Hiding Place, Man’s Search for Meaning, to name just a few. I spent a long time bawling through these books, aching for the people in them, wondering if I would have been as brave as some, if I would have retained my dignity, or if I had a touch of prejudice and would have been the one to turn away from those in need. 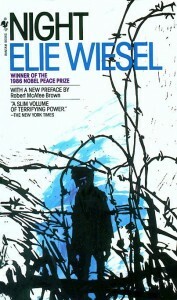 I know reading Wiesel’s Night was a powerful experience for my own teenage daughter. She treasures that book. I’m sure the mother was well-meaning–we’re all just bumbling along, doing our best as parents, aren’t we? But when you take away from a child a book that could make her think deeply about life and past tragedies like the Holocaust, you deprive her of a chance to discover her own humanity. That’s nothing but tragic, in my book. Well said, Elena. I completely agree. My initial reaction to the mother was much less sympathetic than what I arrived at here. I try and assume the best in people, or at least the best intentions. I used to shake my head about such matters as a mother acting the way you describe, but I’m a little more circumspect in my old age. Of course, I’ve been to Germany, visited at least one death camp (Dachau), contemplated the horror there, read Night a couple of times, Ann Frank, The Hiding Place, etc. I don’t own too many movies, but one I own and re-watch from time to time among those few is Schindler’s List. … Deep down, the witness [the author] knew then, as he does now, that his testimony would not be received. After all, it deals with an event that sprang from the darkest zone of man. Only those who experienced Auschwitz know what it was. Others will never know. Despite how diligent we might be in getting information and providing that information to others, it is the individual that decides whether to receive it. Force feeding does not work very well. Neither the starvation. The girl will read the book if she decides to. In fact, depending upon the girl and her relationship with her mother, the mother’s attitude against her reading it may have a greater impact upon her reading it than her not reading it. And you know what? The mother might know just that. I doubt it, but it’s possible. And how about us? What is our responsibility? When we see what you saw in the bookstore there, do we have any responsibility? Are we supposed to see that the girl gets a smuggled copy to read with plenty of encouragement? Are we supposed to challenge the mother — perhaps not then and there, but at some other time so that her relationship with her daughter isn’t impacted more adversely? Are we supposed to go out and proselytize with vim and vigor that everybody should read this and learn this lesson? Or are they to be left in the dark? To vanish into that night? I wish I knew.